..:: Welcome to Sahitya Akademi - About us ::.. The proposal to establish a National Academy of letters in India had been under the consideration of the British Government of the country long before independence. In 1944, the Government of India accepted in principle a proposal of the Royal Asiatic Society of Bengal that a National Cultural trust should be set up to encourage cultural activities in all fields. The trust was to consist of three Academies, including the Academy of letters. After freedom, the proposal was pursued by the independent Government of India, while convened a series of conference to work out the details. Consensus emerged in favour of establishing three National Academies one of letters, another of visual arts and the third of dance, drama and music. But deference of opinion persisted whether the Government should take the initiative and establish the Academies or whether it should wait for the advent of individuals who had the necessary moral authority to establish the Academies. Abul Kalam Azad the union minister of education, was of the opinion that "if we had waited for the Academy to grow up from below, we might have had to wait till the Greek Kalends". It was felt that there was no alternative to Government taking the initiative to set up the Academies. The Government's functioning in the process was to be that of a curtain raiser. The Government would set up the Academies, but once they were establish, it would refrain from exercising any control and leave them to perform their function as autonomous institution. The Government of India decided to establish a National Academy of letters to be called Sahitya Akademi by its resolution No F-6-4/51G2(A) dated December 1952. 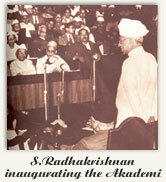 The Sahitya Akademi was formally inaugurated by the Government of India on 12 March 1954. The Government of India Resolution, which set forth the constitution of the Akademi, described it as a national organisation to work actively for the development of Indian letters and to set high literary standards, to foster and co-ordinate literary activities in all the Indian languages and to promote through them all the cultural unity of the country. Though set up by the Government, the Akademi functions as an autonomous organisation. It was registered as a society on 7 January 1956, under the Societies Registration Act, 1860. Sahitya Akademi, India's National Academy of Letters, is the central institution for literary dialogue, publication and promotion in the country and the only institution that undertakes literary activities in 24 Indian languages, including English. Over the 64 years of its dynamic existence, it has ceaselessly endeavored to promote good taste and healthy reading habits, to keep alive the intimate dialogue among the various linguistic and literary zones and groups through seminars, lectures, symposia, discussions, readings and performances, to increase the pace of mutual translations through workshops and individual assignments and to develop a serious literary culture through the publications of journals, monographs, individual creative works of every genre, anthologies, encyclopedias, dictionaries, bibliographies, who's who of writers and histories of literature. It has so for brought out over 6000 books, the present pace of publication being one book every 19 hours. Every year the Akademi holds at least 50 seminars at regional, national and international levels along with the workshops and literary gatherings-about 300 in number per year, under various heads like Meet the Author, Samvad, Kavisandhi, Kathasandhi, Loka: The Many Voices, People and Books, Through My Window, Mulakat, Asmita, Antaral, Avishkar, Nari Chetna, Yuva Sahiti, Bal Sahiti, Purvottari and Literary Forum meetings. Akademi gives 24 awards annually to literary works in the languages it has recognized and an equal number of awards to literary translations from and into the languages of India, both after a year long process of scrutiny, discussion and selection. It also gives special awards called Bhasha Samman to significant contribution to the languages not formally recognized by the Akademi as also for contribution to classical and medieval literature. It has also system of electing eminent writers as Fellows and Honorary Fellows and has also established fellowship in the names of Dr. Anand Coomaraswamy and Premchand. The Akademi has launched Centres for Translation in Bangalore, Ahmedabad, Kolkata and Delhi, and an Archive of Indian Literature in Delhi. A project office for the promotion of Tribal and Oral literature has also been set up in the North Eastern Hill University Campus, Shillong. Many more imaginative projects are on the anvil. Sahitya Akademi is aware of cultural and linguistic differences and does not believe in forced standardization of culture through a bulldozing of levels and attitudes. At the same time, it is also conscious of the deep inner culture, spiritual, historical and experimental links that unify India's diverse manifestations of literature. This unity seeks an international species-dimension through the Akademi's Culture Exchange Programmes with other counties on the globe. Head Office: The Head Office of the Sahitya Akademi is housed in Rabindra Bhavan, 35 Ferozeshah Road, New Delhi. This elegant building was constructed in 1961 to commemorate the birth centenary of Raindranath Tagore, and houses all the three National Akademies, namely, the Sangeet Natak Akademi, the Lalit Kala Akademi and the Sahitya Akademi. The Head office looks after the publication and programme's in Dogri, English, Hindi, Kashmiri, Maithili, Nepali, Punjabi, Rajasthani, Sanskrit, Santhali and Urdu and functions as a regional office as far as these languages are concerned. The Sahitya Akademi Library is one of the most important and unique multi-lingual libraries in India with a rich collection of books on literature and allied subjects in the 24 languages recognised by the Sahitya Akademi. The Library is well-known for its huge collection of books on criticism, of works of translation' and reference books including dictionaries. The newly opened Centre at New Delhi for Oral and Tribal Literature is designated to preserve our heritage in a systematic and scientific way so that Indian masses comprehend the world-view of our ancient societies and keep abreast with our traditional knowledge. The Akademi proposes to archive the original oral texts available in these languages in audio and audio-video formats accompanied by translation in written forms in Scheduled languages and English for wider distribution. The idea is to create a 'House of Voices'. Kolkata Office: This Regional Office looks after the publication and programme work in Assamese, Bengali, Bodo, Manipuri and Oriya, besides a part of publication work in English and Tibetan. It also handles programmes in the other north-eastern languages. The Regional office maintains a major Library. Bangalore Office: Looks after the publication and programme work in Kannada, Malayalam, Tamil and Telugu, besides a part of publication in English. Located in Central College Campus. This regional office also has a major library. Chennai Office: This office works as sub regional office and looks after the Tamil language and its programmes. Mumbai Office: It was set up in 1972, it looks after the publication and programme work in Gujarati. Konkani, Marathi and Sindhi, besides a part of publication work in English and Hindi. Agartala Office (North-East Centre for Oral Literature): To look after unrecognised languages of North-East.